ebbing when I woke up this morning. John Adams is retiring as a judge today and has written this poem as a marker. 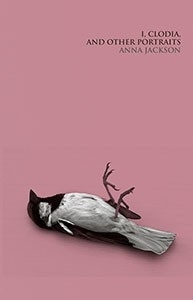 John’s debut collection, Briefcase (AUP), won the NZSA Jessie Mackay Award for Best First Poetry Book at the 2012 NZ Post Book Awards. John Adams also has a Masters in Creative Writing from The University of Auckland and has been a consulting editor of legal texts – such as the Butterworths Family Law series. This entry was posted in Uncategorized and tagged AUP, John Adams, The Friday Poem on November 28, 2014 by Paula Green. 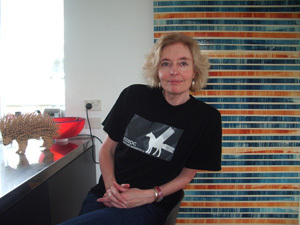 Anna Jackson teaches English Literature at Victoria University and has published five collections of poetry. Thicket was shortlisted for the New Zealand Post Book Awards, and Auckland University Press has just released her new collection, I Clodia, and Other Portraits. To celebrate the arrival of this terrific new collection, Anna agreed to be interviewed by me. With poet and publisher, Helen Rickerby, Anna has organised, Truth or Beauty: Poetry and Biography, a conference currently running at Victoria University (26th to 28th November). Reading and writing and making up long extended stories in my head were almost all I ever did, that and keeping pets, pretty much the same as now. Everything else was an interruption – children are always being interrupted from their purposes. When you started writing poems as a young adult, were there any poets in particular that you were drawn to (poems/poets as surrogate mentors)? To begin with the more musical poets, like Yeats, and my own poetry rhymed and was metred, I often wrote in a ballad metre. I wrote a wonderful long verse poem and then later found whole lines from it were lifted straight from Yeats – I’d remembered them but thought I’d made them up. The Romantics too – Keats and Shelley. But I was also reading Beckett, the novels, for the prose rhythms, which I found breathtakingly funny, and Pinter, again, for the rhythm. Did university life transform your poetry writing? Discoveries, sidetracks, peers? Murray Edmond was my tutor in twentieth-century literature and when I showed him some of my own poetry he told me I had to stop writing in metre and rhyme. The next year in modern poetry taught by Don Smith we learned about Ezra Pound modernising Yeats and about the rigorous line breaks of William Carlos Williams, and then the next year I took American poetry with Wystan Curnow and Roger Horrocks and that was revelatory, and challenging because the experimental L=A=N=G=U=A=G=E poets disturbed and disappointed me as much as they excited and inspired me, and I had to try and make sense of my conflicting responses. There was also always the pleasure of listening to Wystan talk – just like reading Beckett, it wasn’t what he said so much as the rhythms of the sentences – and Roger’s extraordinary generosity as a teacher responding to every student’s individual interests. Does your academic writing ever carry poetic inflections? Are there any theoretical or critical books on poetry that have sustained your or shifting your approach to writing a poem? Indeed! What poets have mattered to you over the past year? Some may have mattered as a reader and others may have affected you as a writer. Can I go back further? The only poetry I think I’ve ever read that actually gave me the physical reaction that Robert Graves claims is the test of poetry, the hairs standing up, the shiver down the spine, the reaction that Emily Dickinson describes as feeling as if the top of your head has come off, is the sequence JUMP, from C K Stead’s The Black River, published in 2008. This is a sequence he wrote after a stroke in a state of semi-dyslexia. Some of the images – death as a Picasso, with a hole in the head – are terrifically, strangely vivid and funny. Some of the puns would seem banal in another context – the mine of the mind – and the wordplay on old rhymes and quotations is often simple enough in itself. But altogether, the effect is extraordinary. It really does somehow feel like he is mining the mine of the mind. It seems to reveal something about the way we think in language, something about the way language works, and there is an almost frightening spirituality about it. The capitalized word JUMP provides section breaks through the sequence, and by the end, the announcement can be made “faith hope the JUMP/ these three abide/ and the greatest of these/ is the JUMP.” This seems true, because we have experienced the way God, or religion, or some sense of an enormous and frightening significance can work through the gaps in language, through the jumps offered by dyslexia, a stroke, poetry. More recently, in the last year or so, collections that have been very important to me include Helen Rickerby’s Cinema, a witty, perceptive collection of poems about the role of cinema in our lives; Ashleigh Young’s Magnificent Moon, a peculiar and wonderful blend of the surreal and the personal, the lyrical and the essayistic; and your own (Paula’s) The Baker’s Thumbprint, with its kaleidoscopic cast of characters, its richly rendered West Coast setting, the light of it, the weight of memory, the lift of imagination. And then perhaps the most amazing publishing event of the last year was the publication of the newly discovered Sappho poem, “The Brothers,” with the TLS offering a spread of different translations of it – including a hilarious one by Anne Carson, wonderfully freewheeling and playful with its contemporary (and not so contemporary) references, while seeming at the same time to go straight to the psychological core of the poem. Even more moving to me though was the translation by Alistair Elliot – I was just so profoundly moved by the technical brilliance of it, as he apparently effortlessly translated the Greek metre into a perfect English equivalent, while – it seems, comparing only the different versions other poets offered – capturing most closely the sense of the original, the significance, in relation to the logic of the poem, of the details. And that reminds me of one more translation event I found terrifically exciting which was the debate between Tom Bishop and Steve Willet in the journal Ka Mate Ka Ora over the translation of a Tibullus poem. I thought Tom Bishop won in terms of debating points, and loved his translation, but it was the level of debate and the skill of both translators that made it such a brilliant and absorbing conversation to follow. I expect I’m going to leave out some names that afterwards I’ll think of with amazement and regret, but among the poets whose work I return to again and again are Bill Manhire, of course, for the rhythms, the lift of the writing (I always hope to catch it a bit), and Jenny Bornholdt again for how rhythmic her poetry is, the way she plays with the rhythms of ordinary speech. Maybe this emphasis on rhythm is surprising, since I think my own poetry is quite prosaic. Though her rhythms are also quite prosaic – I like prosaic. Jenny Bornholdt and Bill Manhire are the poets I’ll read with the feeling that I can sort of catch poetry from them. A new Ian Wedde collection is always an event, and I loved The Lifeguard which came out last year, but I also return often to his earlier collections. I love the experiments with the sonnet in the Carlos sonnets, the intricacy of them and the ease, and I return again and again to the Commonplace Odes, again, the ease, the scope of them. Ease is the word I think of with Robert Sullivan’s poetry too and again that combination of ease and scope – the ease seems to allow the scope. But then again, the nervy tautness of Anne Kennedy’s poetry is tremendously exciting, and though scope isn’t the word that comes to mind in the same way, I like how her collections are always about so much, how she tells stories. James K Baxter, another story-teller, and a poet like Wedde and Sullivan with that combination of ease and scope – I return again and again to the sonnets, that relaxed sonnet he invented. C K Stead got closest to describing how it works, how it depends on a determined and consistent evenness of emphasis, a turning away from metre that is almost a metre in itself. Your poems always offer surprise, a fresh and vital view of things and idiosyncratic musicality (an Anna Jackson pitch and key). What are key things for you when you write a poem? Tautness? And that the poem has enough in it? Your new collection, I Clodia, reflects a return to sequences that are thematically linked as opposed to discrete poems with more accidental connections. What drew you to this choice? I far prefer writing sequences, I find building a sequence tremendously satisfying, and at the same time, it is far easier writing from within a sequence that is already underway than it is to generate new poems out of nothing. But not everything will fit into a sequence, so you have the discrete poems as well, and it can be very pleasing just writing a poem out of nothing, it can feel like a small miracle. And a single poem can be written in a very small space of time. It can rescue a day or a week that wouldn’t have had any poetry in it. I always wanted to write the Clodia sequence, but I wanted to so much, I put it off, till I had enough time to make the most of it. The photographer sequence started out just as a single poem about a photographer, which I wasn’t really sure was even a poem at first. But then after that, whenever I started another poem and didn’t know quite what to do with the material, the image or the idea, all it seemed to take was to attribute the experience to the photographer and it seemed to turn into a poem – it gave the material a dramatic element, a fictional element, that made it do just enough more to suffice for a poem. So then I started adding names to the titles of some other poems and found it gave them the same lift, and got interested in the idea of portraiture so wrote more portraits. I don’t think of that half of the book as a sequence so much as a collection of portrait poems – some of which I converted into portraits afterwards. But the Clodia sequence is very much a narrative with a three act structure, a cast of characters, a problem, a low point, a decisive action, and a resolution. I don’t think anything has ever been more fun to write. And what of Catallus? Why does this subject matter resonate with you so strongly? There’s a terrific essay by a classicist Maxine Lewis that discusses the reasons why writers and scholars are drawn to make narratives out of the Catullus poems (“Narrativising Catullus: A Never-ending Story,” in the Melbourne Historical Journal Volume 441:2, 2013). There are characters that recur in poem after poem, situations that seem to unfold, changing feelings, a developing relationship, and a complicated chronology that the order of the poems seems to defy. It is impossible to read the poems without trying to construct some sort of narrative – and as you do this, you begin to make the narrative your own, to act as a writer as well as a reader. And then, the poems are so funny, often, so passionate, and often so angry. They are also poems about writing poetry, or about the kinds of relationships that can be built around the exchange of poetry, and exchanges of wit. And love, and all the tumultuous feelings it evokes, has always been the best of themes for poetry. And what of the point of view of women rather than the dead white men? I write as Clodia because I love the poetry of Catullus, and I love him no less for being dead. But the point of view of Clodia is everywhere suggested, implied, presented or argued against in the Catullus poems – she is not just a character described by the poetry, but an implied reader teased, provoked, and responded to. The poetry invites an active engagement – I just couldn’t resist. You gained a grant to undertake substantial research for this poetry project. Did you make serendipitous discoveries that flipped or fine-tuned what and how you wrote? I made discoveries I really didn’t want to make. I had to give up on the first poem I wrote for the sequence, because it wouldn’t work with the chronology I developed. I had seasons in the wrong places, I had events happening simultaneously that had to happen two years apart. But I was able to work out a chronology that didn’t contradict any of the known dates or facts and allowed for a coherent story to take shape. The most important narrative breakthrough came in Rome, when I was doing nothing but work on the sequence and so could think always in terms of the narrative with an overview of the whole sequence, not just thinking one poem at a time. I had reached an impasse, and decided to go on a long walk along the river. I’d only taken a few steps out the door when I realised the solution that would make the whole story work. I kept walking for two hours, and then came back and wrote what I would have written if I’d turned back after five minutes. But I wouldn’t have had that five minute breakthrough without the weeks of sustained thinking and writing that led up to it. The second part of the book is like a parade of characters, startling and askew with life, that may have strayed from a Fellini film. They glisten and glow on the page. There seems to be more invention and less autobiography that has marked many of your earlier poems (although not all!). Why this predilection to step into the shoes of others? I love this description of the photographer section! I think photography has a glamour about it I have borrowed for the poetry. I am not sure how much less autobiographical the poetry really is. Even when I put my own children in to poems, as in “Tea-time with the Timorese”, often I made up the events. In Thicket, my previous collection, I might write as “I” but the “I” is as invented as a character like Saoirshe or Roland in the photographer sequence. And, conversely, I could have written the Saoirshe poem or the Roland poem as “I” – both are stories about my own life, in a way, in the same way the Thicket poems are. Perhaps it is a trick on the reader, perhaps the reader brings more to the poems when given a range of character names to lend the imagination to, perhaps the reader is able to read the poems more as stills from a film? I completely agree and think the best poetry is, as Leonard Cohen said, the ash from a life burning well. I don’t like poetry about writing poetry, and the song that most embarrasses me is Gillian Welch’s song about not being able to make up a song – I don’t want to know! If you can’t think up a song, don’t sing one. But the truth is, I am unusually lazy and do less than just about anyone I know – almost nothing other than read and write, and have long baths. I have written a few poems about my hens, hen-keeping being my one hobby, if you can call it a hobby, but there are only so many poems you can write about hens and I think I’ve already reached my limit. So, I can’t think of an honest answer. Talking to my friend Phoebe, maybe? I quite often end up writing down bits of things we’ve said. Some of my best poems are probably actually just things Phoebe thought of. I’d want to read the collected Wislawa Symborska or the collected Bill Manhire, but I’d want to not have read them before, I’d want them to be a discovery. A new collection by either of them, I suppose, but I’d want it to be hundreds of pages long. 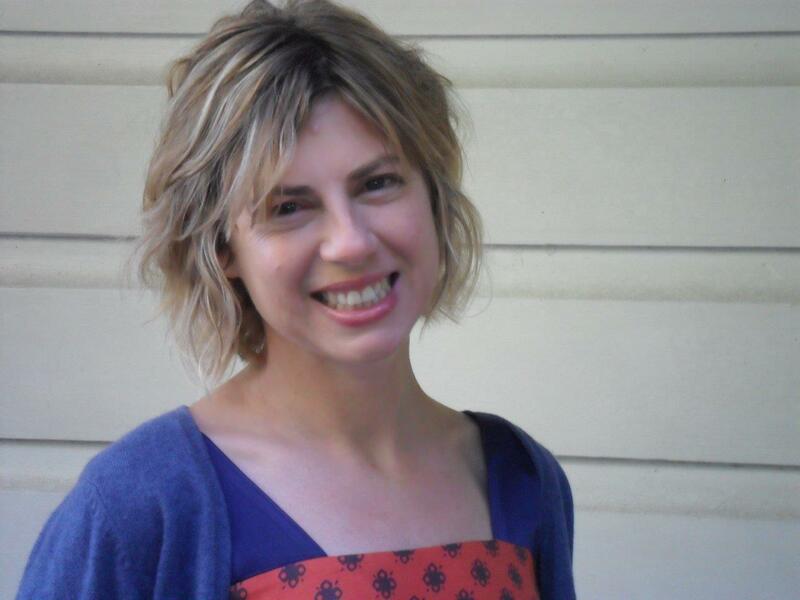 This entry was posted in NZ Poets, Poetry and tagged Anna Jackson, AUP, NZ poetry interview, Poetry interviews on November 27, 2014 by Paula Green. Frances Samuel was a graduate of Bill Manhire’s Creative Writing programme in 2003. 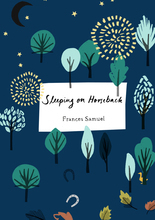 Sleeping on Horseback is her debut poetry collection and it is utterly marvellous. In all my years reviewing books, I have never made this link before, but reading the poems brought to mind the strength and beauty of Bill’s poetry. It’s not like I stumbled across a Bill clone, far from it, but I entered a similar effect of economy, musicality, eclectic detail, roving wit and an ability to surprise or catch a moment in brightness (or darkness). This is a tremendous debut. An early poem, ‘How to draw spires,’ has taken its title from the contents page of How to Draw Churches and Cathedrals. One bit advice from the poet: ‘When you feel yourself distracted/ pretend you are a horse in blinkers.’ This is a bit like poetry — the way the whole world dissolves when you are caught in the moment of the poem. That is what happened as I read this book. Yet poetry also comes out of distraction as you are lifted outside the Be-Here-Now moment to the puzzling, surprising enervation of elsewhere. for the girl to step inside. Wry humour is an appealing feature of a number of poems. There is the amusing wit as Leo Tolstoy talks to a pigeon in ‘Leo Tolstory talks imperialism.’ Or the nostalgic flips as we meet (again) the very hunger caterpillar (‘I see the hungry caterpillar’). France’s debut book offers a symphony in shifting tones, silences, achingly beautiful chords across pages. There are hinges between one poem and the next whereby stone here becomes stone there, or autumn, or snow. You travel through seasons and places and people, and by the end of the book you reach the intimacy of the domestic, of the baby, the tiny person where love and wonder lock fingers. I loved this book. Thanks to VUP I have a copy to give to someone who likes or comments on this post. This entry was posted in NZ Poets, Poetry and tagged Frances Samuel, NZ Poetry review on November 24, 2014 by Paula Green. Come along for this rare opportunity to hear some exciting poets from across the ditch alongside some local treasures. 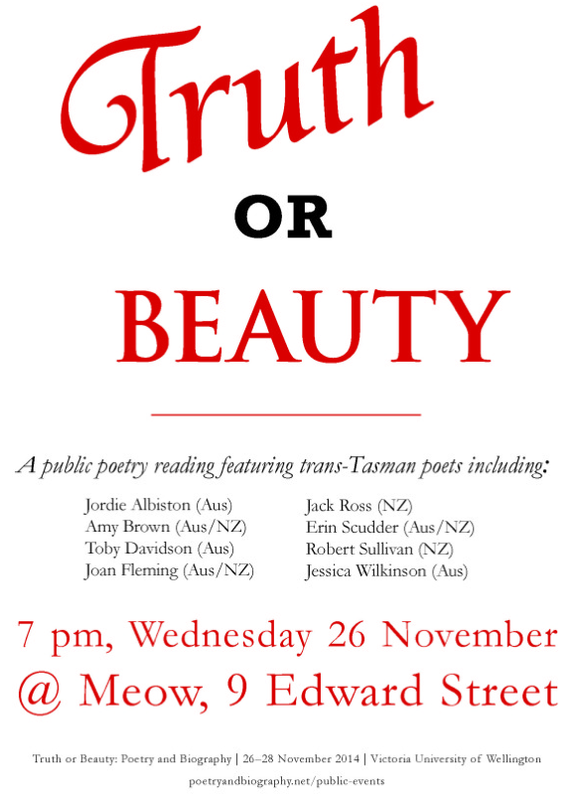 7 pm, Wednesday 26 November, Meow, 9 Edward Street, Wellington. This entry was posted in NZ Poetry reading, Poetry, Poetry Events, Wellington poetry reading and tagged Amy Brown, Erin Scudder, Jack Ross, Jessica Wilkinson, Joan Fleming, Jordie Albiston, Poetry Reading, Robert Sullivan, Toby Davidson, welington poetry reading on November 20, 2014 by Paula Green. A big thanks to Carole Beu and Graham Beattie for all the work that went into The Book Show. Imagine if TVNZ or TV3 or Prime or Sky picked this up and ran a weekly book show in four seasons next year. Consider the benefits to us — with our dynamic and rich cultures of stories and poetry, whether fiction or nonfiction? If creativity is the new word on the block, let’s showcase that creativity in the stories we tell and the poems we make. I applaud Carole and Graham for gifting something to our eroded bookscape. You sent me in search of books that I felt I simply had to read. Thank you! Last night’s episode, the 10th & final episode, of The Book Show on Face TV – Sky Channel 83. This entry was posted in Uncategorized and tagged Carole Beu, Graham Beattie, The Book Show on November 20, 2014 by Paula Green. Michele Leggott did a presentation at the recent Devonport Art’s Festival and has kindly allowed Poetry Shelf to post a transcript and a link to a video stream. There was a send-off, they gave me flowers and asked where I would go. To open the eyes of the soul, I said. There is a way but this is only the first gate. I give what is left of the light of my eyes, I have fallen out of a clear sky. It is twenty years since one small incident changed the way I read and think about the world. I thought it might be interesting to trace the progression of blindness from that critical threshold, when something completely other stepped into our lives, to where it has brought us, still negotiating the terms of what makes a life, a socius and a creative practice. The exploration formed itself into seven interlocking stories, each determined to show that poetry is a language to hold onto when other languages start to disappear. I grew up knowing my grandfather died at the age of 37, and that my father, turning twelve, was convinced he had killed him. You see your father taken to hospital with pneumonia on your twelfth birthday and four days later he is dead. What could be clearer than that? My mother always said she was relieved when my father turned 38. He was, she said, hell to live with during that year, sure that he would die. That he was stepping along a spiral road whose arms might curl around him as suddenly as the siren of an ambulance. In our family, you look out for trouble at 37. Or it finds you at an intersection in a provincial city, waiting for the lights to change. The children in the back are seven and four, the talk goes to and fro, the long day of driving is hardly underway. I glance at the red light. It is not there. I look again. It has come back. Then the lights turn green. Shaken, I drive on, to Taranaki and back, to and from work through the months afterwards, wondering why the eye doctor can find nothing wrong. We have known about the mild nightblindness for some time now. I don’t drive at night but otherwise it has not affected us much. But this disappearing of the red light. What is it? What happened to blank it out? why was it back a moment later? At the end of a terrible year during which I thought I was going crazy, the doctor looked again and saw what had been there all along. The retinitis had found its way into my central vision. I opened a file on the computer and called it Writing Back. But poetry is a language to hold onto when other languages disappear. Watching the fiery shape that circled in front of my eyes in dark places, I knew it was a retinal afterimage. But it was also Dante’s rose, it was Eliot’s knot of fire and Circe’s hello, from an island with a name that sounded like a wind harp. I spent the summer writing back to these and other circles. Later I discovered that my grandfather died when he was 36. It was the year of his death, 1937, that stuck with my father and began the spiral walking. She was a Cretan bee person, perhaps a dew person, with composite eyes, tendril hair and a flounced skirt. Her attendants flew over an open flower while she stood on dancing feet nearby. I redrew her. The skirt fell away and its outline became flexible limbs. She sprang from the page, she sprang from the screen. She sprang from the leg of the little Minoan table and off they went together, the bee person, the dew person. I stood in my garden, said one. Dance me to the end of love, said the other. It is an old story, possibly a spiral. What I liked best about making the movie was artifice. We called it Heaven’s Cloudy Smile, two sequences, one by me the other by poet and performer Alan Brunton. We shot scenes in Auckland and Wellington. Director Sally Rodwell spliced them into a narrative that brought one poet into the other’s domain, call it blindness, call it descent, call it a terrace with a far-reaching view. At the end of the Auckland filming I sat on the front porch watching a new moon and waiting for a taxi to take me to the airport. A van pulled up, out sprang a driver looking like a man who has come home from work to find a film crew in his house. He hands me into the van and we roar up the road into the setting sun. Sally was like that. Anyone could find themselves on camera, caught from a day or a night into the day or the night. In Thistle Hall I watched Alan at work in a room with a single shelf of books, a jug of milk and a white curtain blowing through an open window. He turned over pages of Artaud. The curtain billowed. He drank the milk. Innumerable bees crawled over the book, obliterating Artaud’s face. Two steps away stage lights lit the gauzy curtain and a fan sent it billowing through the window that was a square cut into a theatre flat. An apiarist stood by, waiting to rehouse his drowsy bees. Milk and honey. Body and soul. Light and dark. But it is the final night of the shoot that stays with me, not for the tricks of light or mise en scene but as soundscape. We were late arriving at the studio in Lyall Bay. The schedule had run out of hours and the voice-overs had yet to be done. Something about tiredness, about living and working closely for so many days. So many arguments, so many compromises. Something about the surf breaking evenly on the dark beach in a rising wind. Sally pushes harder than ever, sure of her direction in this and in every matter concerning voice and visuals. The planes intersect. Fire and dew collect in the corner of an eye. The great oratory of the labyrinth seems for a moment on the tip of your tongue. If touch is a torch and the difference still you, can it matter so very much if I do not see your face? I hold you, I kiss you. How can I go on without you? The price of the gate is too high, it tears me apart and I am afraid. The conservator reads invisible words from the sheet of paper he is holding under ultraviolet light. As sentences take shape I hear part of a story written by poet Robin Hyde before she left New Zealand for good early in 1938. Typewriter indents, tactile but ghostly, have drawn us to the title page of her most famous sequence of poems. Now the indents show that the page was a backing sheet for the story before Hyde rolled it into her machine again and began typing the poems about beaches from her Wellington childhood. Mounding us to the chins: (don’t you remember? Were moist against the sunburn on your knees. Don’t you remember? Won’t the lost shake for any cry at all? But her Wellington memories, vivid and sharp-edged, are double lensed. She has been home visiting family before Christmas, and it is the hot weather of December 1937 that has opened the old vistas. As she boards the train for Auckland, a twelve year old boy in the Hutt Valley is about to see his father lowered into the ground at the old Taita Cemetery. The same air. The same heat. The same city. She is leaving. He must stay. There is the thrill of discovery. The curator comes in. She has found a printing date on the back of the studio portrait of Robin Hyde in her exhibition at the library, a few steps from the conservation workroom. Until this morning I had only a grainy crop of the photo taken from a magazine. Now there is a fine print and the chance of tracing its negative in the nearby collections of the national museum. Young Bronzey Plumage, what will you do with women? which cascades down 144 steps. At the bottom, magnolias surround a pool. The words follow us into the forest with its Via Crucis chapels and little hermitages. There are several fountains, all exquisite, but none to match Fonte Fria, the fountain of the Sun’s Gate. We walk up the double flight of 144 steps. We pause for contemplation at each of the ten pools with their black and white mosaic tiles. In the cave at the top we see water pouring from the wide open mouth of a stone dolphin. We walk slowly down, one either side of the cascade, and come to the pool at the bottom. There are no magnolias. White-painted stones bear rough messages in black: No Washing in the Fountain. No Picking of Floras and Ramagens. A black swan and a white swan ripple the surface of the water. Alan and Sally and their baby daughter Ruby visited Buçaco in the summer of 1987. They travelled on to northern Spain and looked out over the Western Ocean at Finisterre. The Buçaco fountain and its pools were pledged in memory to that itinerant summer and the promises one made to the other that brought them back to New Zealand the following year. Our journey takes us into the Serra da Estrela and south among the hill towns near the Spanish border. We come to Lisbon, to the Hotel Borges on Rua Garrett. Outside is a larger than life bronze of Fernando Pessoa, Portugal’s most celebrated modern poet. He sits in the shade of an umbrella near the Cafe Brasileira, a favourite watering hole for writers and artists in the 1910s and 20s. Tourists have their photos taken with Pessoa, sitting in the bronze seat supplied for the purpose. I wonder whether Alan, dead almost two years of a heart attack, would have loved or loathed this commemoration of a national icon. Certainly he would have appreciated the sculptor’s decision to scale up the poet’s dimensions. You must assign a correct path to the poem. It is recognisable only by its date of composition. Which may not be the same date it writes about. It is the sound of one person talking. The other part of the conversation is taken by silence. The poem talks to the future. Bring people together. Make spaces for speech and for listening. Make time for seeing how event is a poem, its speakers people to whom we give attention or who give the gift of their attention to us. When they go from the place they take the poem with them, severally and as a whole, moving out with the new-made thing. By these means it travels on in a heart here, in memory there. By these means it will reappear somewhere else, in another time and another place. Every poem is an event with a horizon. Poetry is made by all in the free invention of each moment and each event: Lautréamont’s poésie faite par tous. The beginning of a revolutionary celebration. A going on. Bring poets together. Make events that take them from one place to another. Call them festivals, symposiums, meetings. Call them bars, cafes, theatres. Call them marae or community halls. Call them feasts or farewells, a-capella notes for stepping from one island to another. I do not evolve, I TRAVEL, observes Fernando Pessoa. We don’t only read to believe, writes Martin Edmond. Sometimes we do it to travel, to forget, to dream, to change. Or Lisa Robertson: We need dignity and texture and fountains. Bring dancers with whirling bundles of flax. Bring flutes and drums. Bring the saxophone to lead the white coffin from the deconsecrated chapel. Sally Rodwell, unable to live without Alan and terrified of the psych ward to which she felt she was descending, has ended her own life after four years of widowhood. The saxophonist hears his high C break into a thousand pieces and fall to the stone floor. to lose what I never had do you understand? Posts for my part of the Poet Laureate blog run from January of one year to July of the next. They are snapshots of events connected with the laureateship and with the project that became a book called Mirabile Dictu. A small number of poems were posted to the blog, usually to mark the occasion for which they were written or as staging points in the evolution of the book. Mirabile Dictu means wonderful to relate, and the book’s poems appear in the order they were written, starting with a poet’s funeral and finishing with a family wedding. They make a whole that traverses time and place. In some ways they are one long poem in many parts, a poem that started not knowing where it would end. The blog and the poems continued beyond the last poem of the book, a kind of overflow to wrap up the 18 months of the laureateship. There were many highlights in the real world during that year-and-a-half and the blog tries to catch and put visuals to some of them. But it was the work of writing another world into existence, of hearing and seeing it take shape alongside daily reality, that made the laureate time exceptional. As each poem was written, it was sent to those whose words or presence are part of its tissue memory, a network of first readers who made the experience intensely sociable, criss-crossing and overlapping with each other, one leading to the next or back to an earlier meeting point. Expert feedback arrived from these first readers, who were quick to nose out inaccuracies. I was listening to the radio after getting back from the book launch and handing over the laureateship. I was also composing a thank you for my cousin’s gift of some spectacular seafood after the family gathering in Wellington. In that heady moment the answer to an old question seemed suddenly clear. I am trying to complete an editing project. I am trying to write an introduction. I am trying to bring together the book of poems I can still see on my computer screen. It is a race against time. I am using the audio software to listen when I need to read the screen. I am using a magnifier window to bring parts of the screen into close focus. My head hurts. The sentences won’t form. I cannot leap the gap that opens between the end of one huge word in white on my black screen and the beginning of the next huge word. It will not do. I cannot do it. We have spent several months learning how to write and edit with the audio software. I dream constantly of being five years old and learning to read, learning to write, learning to think. I am often in the dappled shade under the tree at the school gate. I have my book and the crayon which is dark until on paper it releases the colour that is neither blue nor green but somewhere between or both. I know how to write. I know how to draw. I know how to read the world. I am five years old, and it is now. Then it happens. I turn off the visuals and write using my ears and fingers. The words come easily. They are slow but they do not hurt. The visuals have gone. I take out the last contact lens for the last time and go to sleep terrified. In the morning I will say that this is the moment I stopped beating up my eyes. They have done their work and I am thankful for it. Without them I would not have deep reservoirs of visual memory. Let us go on into the dark and not be afraid. There is a lot to be done. It is June last year. It is now. Coimbra spiral, 2004. Mark Fryer. Through a glass darkly, Michele and James 1993. Michele Leggott. Bee person, dew person. As far as I can see, 1999. Nunzio’s gate, Heaven’s Cloudy Smile,1998. Sally Rodwell. Portrait of Robin Hyde #4, , 1936. Spencer Digby. Hyde portraits #1, #2, #3, #4, #5. 1936. Spencer Digby. .
Buçaco. palace hotel with swan, 2004. Mark Fryer. Assisi Gate, 2008. Mark Fryer. Laureate CD design, 2009. James Fryer. Coimbra spirals down street, 2004. Mark Fryer. This entry was posted in Uncategorized and tagged Michele Leggott, Small Stories from Two Decades on November 19, 2014 by Paula Green. I’ve been writing a long poem for some months now. One of the major features of this process has been the constant struggle between the disjunctive possibilities of poetic form, and the narrative, which I want to be continuous, unfolding forward. How does a poet successfully balance these two approaches, to achieve something that unravels over pages, but also has the capacity to shift gear suddenly, which surprises and moves around within itself? The two forces seem diametrically opposed at times. I’ve been casting about, trying to figure out how this is managed in long poems I love – Jenny Bornholdt’s Rocky Shore, Anne Carson’s Glass Essay, and now, Louise Glück’s Faithful and Virtuous Night. This seems to be what follows: poems that shift between time, place and speakers as they tell a story, losing me sometimes, putting me on the cliff-edge of something vast and unspoken, pulling me back, coming full circle. But always the sun rises again. The same motifs recur, pressing into the same territory: night, endings, shadows, voicelessness, death, silence. Yes, it’s rather terrifying. It is also a very beautiful piece of work. Every poem I’ve looked at again since that first read-through can, I think, stand on its own, even though each feels very definitely part of this book-long narrative. The room was as I left it. There was a bed in the corner. There was the table under the window. as flickering among the shade trees. Poet, Angela Andrews, is currently working on her Doctorate in Creative Writing at Wellington’s International Institute of Modern Letters. Jane Arthur: I’ve not been entirely faithful to any one poet or book lately. I’ve been exploring with the attention-span of a sugared toddler: pulling books off my shelves, jumping down rabbit holes (or wormholes, or foxholes) on the Poetry Foundation website, obsessively clicking on surely every poem in the wonderful Sport archive, buying new releases and not opening them for months, leaving piles of thin volumes around my house – by my bed, next to the fruitbowl – and in others’ houses. 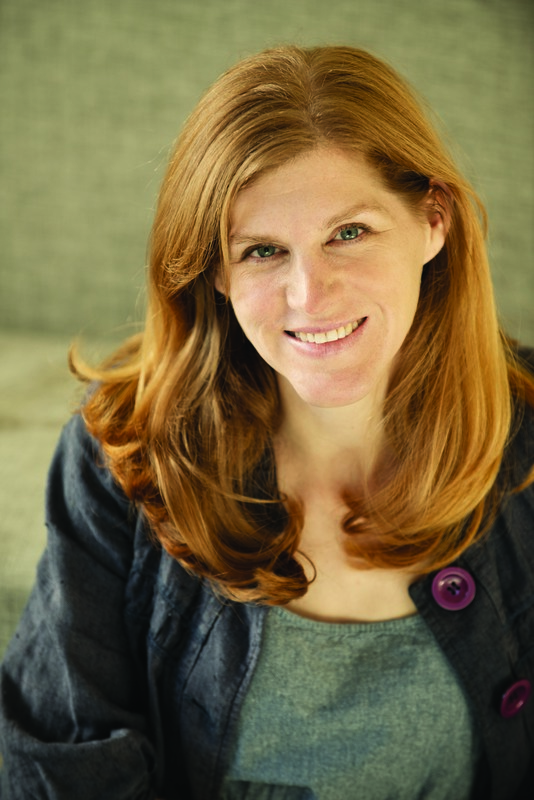 Jane Arthur is production manager at Wellington children’s book publisher, Gecko Press. She was most recently published in the inaugural issue of the new NZ literary journal, Sweet Mammalian (sweetmammalian.com). footwear for a centipede aligns beneath his broad veranda…. I burned my bridges happily…. We also visit women of mana, a Maori Jesus who eats fish ‘n’ chips with tomato sauce and wears wrap-around sunnies, a rangatira in conversation with a slave on the Wellington Harbour in the early 1840s, various pubs and parties and a hui at the doorway to heaven. Serie Barford is an Auckland-based poet. Her most recent collection is, Tapa Talk. The poems in Tim Upperton’s book, A House on Fire, appeal because of his use of inventive imagery, his direct observational style, and the painterly quality of his scene setting. His poetry is spare, concise and technically proficient. Decaying corn, in a poem about a vegetable garden, keeps “its thin hands in its sleeves.” In a poem about the tradition of the Kiwi Sunday roast, the mutton “heaves” in the pan. Upperton’s evocative, well-crafted, warm poems pare life back to its bare essentials – family, food, love and nature. Read Upperton’s poems – you’ll discover magic in the ordinary. Stephanie Mayne is an Auckland librarian and poet. This entry was posted in Uncategorized and tagged Angela Andrews, Jane Arthur, NZ Poetry reviews, On the Shelf, Serie Barford, Stephanie Mayne on November 17, 2014 by Paula Green.